For those interested in Irish Art but still not familiar with all the day to day terms used by galleries we have produced this list of definitions. We hope you find them useful. If there are any art terms not listed which you know of or would like answered please email us and we will try and help. ABSTRACT - Art which departs from real subjects and representational accuracy in preference to shapes, colour and texture. This form of Irish Art is sometimes referred to as non-representational art. ABSTRACT EXPRESSIONISM - New York painting movement of the 1940's with its artistic roots based upon Abstract Art. This type of painting is often referred to as action painting. ACADEMY - Originally the school of philosophy founded by Plato in the garden of Academe, a district in the vicinity of Athens. Today means a learned Art Group recognised as being authoritative in its discipline, or a school in which art is taught. British Art term usually refers to a recognised society involved in the promotion of the arts. The British Royal Academy of Arts was established in 1768. Today it serves primarily as an art school and venue for regular Art exhibitions. ACCENT - where an artist highlights specific parts of a painting and in the process creates in them more attention. ACTION PAINTING - where artists use vigorous physical activity to create paintings usually on a large abstract style. AERIAL PERSPECTIVE - Painting technique used to reproduce real life vistas - makes distant objects appear to have less colour, texture, and distinction. ART DECO - Art style popularised in the 1920s and 30s. Art Deco utilised modern materials and the art style was characterised by repetitive, geometric lines, patterns and curves. ART GALLERY - Public and/or private organisations or buildings where works of art are displayed. There are many Irish Art Galleries. 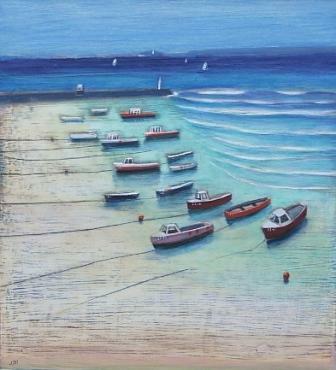 Major regions for art galleries are: Antrim Art Galleries and Dublin Art Galleries . The National Gallery of Ireland is in Dublin. AVANT-GARDE - French term meaning at the forefront. Art which is innovative and producing new ideas and subject matter. First appeared in France during nineteenth century and is usually credited to Henri de Saint-Simon. He believed in the social power of the arts and regarded artists, alongside scientists and industrialists, as the leaders of a new society. The term Avant-garde art began around the 1850s with the Realism of Gustave Courbet. He was strongly influenced by early socialist ideas. Successive art movements such Cubism and Surrealism built upon the idea. Avant-Garde today is closely associated with the term Modern Art particularly when artists work is seen as high on originality. BEAUX-ARTS - A school of fine arts located in Paris which stressed the necessity of academic painting. BEESWAX - Art material made from from honeycombs, used as a medium in modelling and in wax varnishes. BRONZE - An alloy of copper and tin used by Artists for sculpture. CANVAS - Fabrics that are prepared and used for painting. They maybe in panels, stretched on frames, or obtained by the yard. Art canvas varies from very fine such as the linen type used by Red Rag Gallery artist Sylvia Antonsen to the more textural canvas preferred by James Watt. CANVAS TRANSFER PRINTS - This technique simulates the rich texture and appearance of an original oil painting It is an intensely detailed process whereby the image of a painting is chemically 'lifted' off and transferred onto an artist canvas. Red Rag Prints are produced using rigid quality standards and meticulous attention to detail ensuring the ink retention, paper removal, and bonding are successful and the art work remains true to the original and is guaranteed by the artist. CASTING - Used by Artists to reproduce original art sculpture. Casting moulds are typically made from plaster, clay, or wax. CASTING - Method by which Artists produce Sculptures. Liquid materials such as clay, bronze and plastic are poured into a mold and allowed to cool and harden. The material is transformed into the shape of the mold. CERAMICS - Hard glasslike compound. Ceramics are made by exposing clay to extreme heat in a kiln. The result is earthenware and stoneware art pieces. CHIAROSCURO - The dramatic use of light and shadow to create a mood or a focal point in a painting. CIAS - Founded in 1962 the Contemporary Irish Art Society (CIAS) is an art society for contemporary visual arts culture in Ireland. As well as the purchase of artworks, it runs a regular programme of visits to public and private galleries, artists' studios and private collections. COMPOSITION - the design and organisation of individual components to produce a piece of Art. The term typically applies to two dimensional Art where balance and proportion are essential. CONCEPTUAL ART - Art which is intended to communicate an idea or concept where the concept or idea and process is of greater importance than any tangible result and therefore does not have necessarily involve the creation or appreciation of a traditional art object such as a painting or sculpture. CONTEMPORARY ARTIST - The expression contemporary artist applies to all Irish Art produced today. It also typically applies to any Irish Art from around the 1960s to today. All Red Rag paintings are sourced from Irish Artists who are alive and producing art works today. 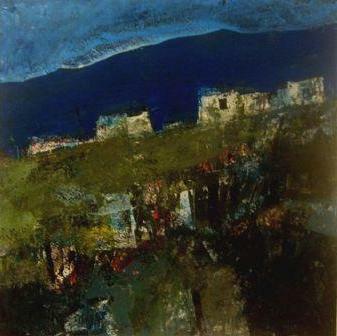 CONTEMPORARY IRISH ART - Generally defined as Irish Art which was produced from the second half of the twentieth century upto today. CUBISM - Influential art movement of the twentieth century. Cubism was begun by Pablo Picasso (1882-1973) and Georges Braque (1882-1963) in 1907. They were inspired by African sculpture, and by painters Paul Cezanne (1839-1906) and Georges Seurat (1859-1891), and by the Fauves. In Cubism the subject matter is broken up, analyzed, and reassembled in an abstracted form. Picasso and Braque initiated the movement following advice from Cezanne, who said artists should treat nature "in terms of the cylinder, the sphere and the cone." DADA - An early twentieth century art movement which emerged during the First World War. Rather than supporting a specific art style of its own Dada ridiculed traditional art forms and contemporary culture. Dada artists produced art works which were considered deliberately nonsensical. EARTHENWARE - Ceramic ware made from clay fired in the kiln at the lowest temperature ranges. EDITION - In print making the number of images authorized by an Artist of a painting made from a single plate. ETCHING - The earliest print graphic. The artist draws, using a sharp tool referred to as a burin, on the surface of a copper or zinc plate. Each plate is coated with an acid-resistant varnish, or "ground". As the artist draws - ground and varnish is removed leaving an image on the plate from which the print is made. The plate is dipped in acid, which reacts with the soft, exposed metal, creating grooves or sunken channels, which will hold the ink. Ink is then applied onto the plate filling the grooves. The surface is wiped clean and the inked plate pressed onto moist paper, releasing the ink and creating the image in monotone. In most cases, the plate is then defaced or destroyed preventing the creation of any additional prints. EXPRESSIONISM - A concept of painting in which traditional adherence to realism and proportion is secondary to the artist's emotional response to the subject. F - Fellow. The term is most often used in an art context to mean : part of an elite group of learned people who work together as peers in the pursuit of art. However, there are no precise rules for how the title is used, and each academic and art institution grants the title as it sees fit. FAUVISM - Painting style of early 20th century. The word means 'Wild Beast'�, so called because of the use of bold, clashing and vibrant colours. Henri Matisse and AndrÃ© Derain were leading artists known for this type of painting. The Fauve movement was a major influence in the paintings of the early Scottish Colourists. FIGURATIVE - Figurative is a term used to refer to any form of modern or contemporary art that retains strong references to the real world. It is used to describe Landscape and Architectural painting subjects, but more often it is associated with the human figure. In a general sense figurative also applies retrospectively to all art before abstract art. FINGER PAINTING - Painting where an artist applies paint using the hand rather brush or palette knife. Typically applied to strong non-absorbent paper which does not smear. FIRING - A process of applying heat to pottery or sculpture in a kiln or open fire. GESSO - An under-painting medium consisting of glue, plaster of Paris, or chalk and water. Gesso is used to size the canvas and prepare the surface for painting. 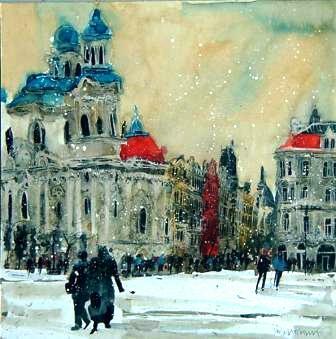 Red Rag Scottish Artist Jock MacInnes paintings are undretaken on Gesso boards. GICLEE - (Pronounced: Zhee-clay) Considered an original graphic, Giclee prints are produced as multiples. Red Rag Limited Edition Prints are normally limited to 100 or 195. The term originates from the French "to spray" and employs inkjet colour application and digital colour separation. Giclee is a computer controlled, fine art print making process. It uses millions of ink particles in a very fine spray, about 15 microns in size which is four times smaller than a human hair. The microscopic jet-stream spray is applied simultaneously to the paper and is controlled by a crystal frequency. The print is then coated with up to 15 layers of waterproof U.V. varnishes. HERRINGBONE PERSPECTIVE - is where lines of projection converge not on a vanishing point but on a vertical axis at the centre of the painting or drawing. IMPASTO - The thick textured build up on the surface of a painting which is produced by an Artist when repeated application of paint is applied. IMPRESSIONISM - Art style developed in France where artists like Degas, Monet, Pissaro and Renoir painted images of their subjects showing the effects of colour, sunlight and shade on things at different times of day. The artists dissected light into its component colours. Each artist concentrated on light and the way it effected the visible world. Short brush-strokes of bright colour were chosen to represent light which was then broken down into its spectrum components and re-combined by the eyes into another colour when viewed at a distance. Current British Artists showing at Red Rag Modern British Art Gallery and painting in this style include Romeo di Girolamo. KILN - Furnace used by Artists for firing pottery and sculptures. Typically temperatures range from 1000 ' 1200 degree centigrade. KINETIC ART - An art style which contains and incorporates movement as part of the art piece. LINEAR PERSPECTIVE - is a technique used by artists in painting and drawing to create an illusion of spatial depth on a two dimensional surface. The artist uses consistent geometric rules to make objects appear as they do to the human eye. For example: parallel lines appear to converge in the distance although in reality they do not; or lines of buildings are angled inward to make them appear to be going back into space. The recognition of linear perspective dates from the 15th century and is attributed to Filippo Brunelleschi's use of perspective painting. LINOCUT PRINTMAKING - Linocut is a printmaking technique in which a sheet of linoleum is used for the releif surface. A design is cut into the linoleum surface with a specialist tool. The raised (uncarved) areas representing a reversal (mirror image) of the parts to show printed. The lino sheet is then inked with a coated roller and pressed onto paper. LITHOGRAPH - This printing technique uses a planographic process in which prints are pulled on a special press from a flat stone or metal surface. The surface has been chemically sensitised so that ink sticks only to the design areas, and is repelled by the non-image areas. Lithography was invented in Solnhofen, Germany by Alois Senefelder in 1798. The early history of lithography is dominated by great French artists such as Daumier and Delacroix, and later by Degas, Toulouse-Lautrec, Picasso, Braque and Miro. LITHOGRAPH (OFFSET) - Offset Lithograph has become the most widely used commercial printing process for art prints. This is a method of printing from a metal or stone surface on which the printing areas are made ink-receptive. Rather than pressing inked images onto paper using plates with raised or etched plates, an image is transferred to the paper using oil-based inks, chemically-treated plates made from photographic negatives, and an offset cylinder. Today the field of signed and numbered offset lithographs has become accepted in the art market and many have proved a reasonable Irish Art Investment. MEDIUM - The material used by Artists to create a painting or sculpture artwork. For example: Oil, Acrylic, Mixed Media, Watercolour, Bronze. 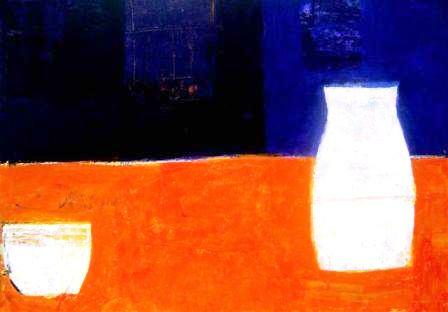 MINIMALISM - A Mid 20th Century style of painting and sculpture. The finished piece of art is reduced to a minimum number of lines, colours and shapes. Space and relationship of the elements are key in the art work. MODERNISM - An Art style that breaks with traditional art forms and searches for new modes of expression (early 20th century). MONOCHROMATIC - In a contemporary painting the colour scheme that involves using different degrees of a single colour. MONOPRINT - A one off kind of art print made by painting on a sheet of glass or metal, then transferring the still-wet painting to a sheet of paper. Sufficient original paint remains on the plate after the transfer so that the same or different colours can be re-applied to make subsequent prints, but no two prints are ever exactly alike. MURAL - A continuous painting which is designed to fill a wall or other architectural area. NEOCLASSICISM - New Expressionism was an Art style applied to 19th century Western Art. It reflected the classical art works of Greece and Rome. Paintings have well defined images, deliberate composition and utilize cool understated colours. NEW WAVE - Combination of cartoon, graffiti and performance art in a minimalist, unsophisticated style. ORIGINAL PRINT - A print made from the original plate, block, stone, screen, etc. which the artist has created and printed. PAINTERLY - A form of painting where images are predominantly created by use of colours rather than by defined lines. The Artist's brushstrokes are very evident. Red Rag Scottish artist Alma Wolfson uses this technique. PERSPECTIVE - The way artists create an illusion of a three dimensional image onto a two dimensional painting or drawing. Art techniques used to achieve perspective are: ensuring variation between dimensions of scenes, placing images that are on the ground as lower when nearer and higher when deeper. There are three major types of perspective: aerial, herringbone, and linear. POINTILLISM - The art of Pointillism is a form of painting in which tiny dots of primary-colours are used to generate secondary colours to produce a luminous quality. Pointillism is focused on the specific style of brushwork used to apply the paint. The term "Pointillism" was first used with respect to the work of George Seurat, and he is the artist most closely associated with the art term. Pointillism is considered to have been an influence on Fauvism. POP ART - An art style derived from commercial art forms. Typically paintings and sculptures are larger than life replicas of day to day subjects. Pop Art developed in the late 1950s and was characterised in the 1960s by such artists as Andy Warhol, Claus Oldenberg, Roy Lichtenstein, George Segal, and Robert Indiana. PROVENANCE - Provenance is the record of all previous ownership of a painting or work of art. Ideally this should cover the time it left the artist's studio to the present location, so there is evidence of unbroken ownership history. All Red Rag British and Scottish art and paintings are sourced directly from the Artists studio. RAKU - Technique used by Sculptors to produce porous low-fired ceramic ware. The finished art pieces are characterised by subtly changing colours, over which the Sculptor has little control. REALISM - Art style which evolved in the 19th century where a painting produced a view of the natural world in a highly representational way. Subjects were selected from everyday events and situations. RUA - Royal Ulster Academy (RUA). Formed in 1878 today the Art Academy is an independent fine arts institution which supports practising contemporary artists through a programme of education work, lectures and exhibitions. Red Rag Gallery Artist Robert Lee-Wade is a member of the RUA. SCULPTURE - A three dimensional art form. Artists use a variety of materials to produce sculptures including wood, metal and clay. STRAINER - The canvas of most contemporary paintings is secured to a wooden frame that is commonly referred to as a strainer or stretcher. Strainers are equipped with expandable corner joints that can be adjusted to insure that the painting remains taught. The joints can be expanded by driving small wooden wedges into the interior corners of the strainer at the back of the painting. STRETCHER - The canvas of most contemporary paintings are secured to a wooden frame that is commonly referred to as a stretcher or strainer. Stretchers are equipped with expandable corner joints that can be adjusted to insure that the painting remains taught. The joints can be expanded by driving small wooden wedges into the interior corners of the stretcher at the back of the painting. STUCKISM - Stuckism is a radical art movement which seeks to promote Figurative Painting and against Conceptual Art. Stuckism values self-expression and adopts a holistic approach to art. TEMPERA - A traditional painting medium used by the grand masters. Produces a long lasting effect - but has the disadvantage that Artists need make-up paints each day using egg yolk as a binder. VISUAL ARTS - Visual Arts are all art forms which are primarily visual in nature as opposed to other arts eg performing arts. Visual Arts includes: painting, sculpture and photography. Irish and British Arts have historically viewed fine arts, painting, sculpture and printmaking as different to the craft areas of applied art, design, jewellery and textiles. In Britain this is difference is attributed to the work of a group of artists led by William Morris known as the Arts and Crafts Movement whose political aim was to value all art forms. The movement was at odds with modernists who wished to keep high arts from the masses by keeping them esoteric.